Start off your visit on the 7th (Sun): head outdoors with Archipelago National Park. Keep things going the next day: take in the waterfront activity at Helsingholm Guest Harbour and then explore the world behind art at Soderlangvik. To find traveler tips, photos, ratings, and other tourist information, you can read our Kimito Island day trip planning website . Helsinki to Kimito Island is an approximately 2.5-hour car ride. You can also do a combination of train and bus; or take a bus. In April, daytime highs in Kimito Island are 9°C, while nighttime lows are -1°C. Wrap up your sightseeing on the 8th (Mon) early enough to drive to Turku. 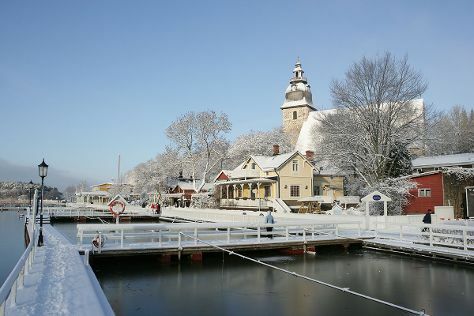 Naantali Old Town and Turku Cathedral are good opportunities to explore the local culture. There's lots more to do: delve into the distant past at Aboa Vetus & Ars Nova, examine the collection at Sibeliusmuseum, explore the world behind art at Turku Art Museum, and take an in-depth tour of Pharmacy Museum and Qwensel House. To find reviews, other places to visit, photos, and more tourist information, you can read our Turku trip tool . Getting from Kimito Island to Turku by car takes about 1.5 hours. Other options: take a bus. In April, daily temperatures in Turku can reach 9°C, while at night they dip to -1°C. Finish up your sightseeing early on the 13th (Sat) so you can travel to Uusikaupunki. Kick off your visit on the 14th (Sun): pause for some serene contemplation at Uusikaupunki Old Church, see the interesting displays at Bonk Museum, and then examine the collection at Automobile Museum. On the next day, visit a coastal fixture at Isokari Lighthouse. To see traveler tips, more things to do, where to stay, and more tourist information, go to the Uusikaupunki trip planner . Traveling by car from Turku to Uusikaupunki takes 1.5 hours. In April, daily temperatures in Uusikaupunki can reach 9°C, while at night they dip to -1°C. Finish your sightseeing early on the 15th (Mon) to allow enough time to travel to Korpo. Kick off your visit on the 16th (Tue): step off the mainland to explore Jurmo Island, make a trip to Skargardscentrum Korpostrom Archipelago Centrum, and then pause for some serene contemplation at Korpo Church. To see ratings, where to stay, other places to visit, and other tourist information, you can read our Korpo online trip maker . You can drive from Uusikaupunki to Korpo in 3.5 hours. In April, daily temperatures in Korpo can reach 9°C, while at night they dip to -1°C. Wrap up your sightseeing on the 16th (Tue) early enough to travel to Nagu. Kick off your visit on the 17th (Wed): learn about all things military at Maritime Exhibition Sjofartshuset and then pause for some serene contemplation at Nagu Church. For maps, more things to do, photos, and more tourist information, you can read our Nagu trip itinerary app . Traveling by car from Korpo to Nagu takes an hour. Expect a daytime high around 9°C in April, and nighttime lows around -1°C. On the 17th (Wed), wrap the sightseeing up by early afternoon so you can travel to Parainen. Pargas is a municipality of Finland, in the Archipelago Sea. On the 18th (Thu), examine the collection at Pargas / Parainen Local History Museum, then pause for some serene contemplation at Pargas Church, then contemplate the waterfront views at Pargas Lime Stone Quarry, and finally make a trip to ArtBank. To see ratings, traveler tips, reviews, and other tourist information, use the Parainen trip planner . Getting from Nagu to Parainen by car takes about an hour. Expect a daytime high around 9°C in April, and nighttime lows around -1°C. Wrap up your sightseeing on the 18th (Thu) to allow time to travel to Rosala. Start off your visit on the 19th (Fri): examine the collection at Rosala Viking Centre and then visit a coastal fixture at Bengtskar Lighthouse. For reviews, ratings, maps, and other tourist information, read Rosala online road trip planner . Traveling by car from Parainen to Rosala takes 2.5 hours. April in Rosala sees daily highs of 9°C and lows of -1°C at night. On the 20th (Sat), you're off tohome.